We respect the Zenbook Prime UX32 for what it tries to accomplish, but we have mixed feelings about it as a product. Asus has long pursued the premium PC market. The company lacks the marketing know-how and grunt of HP or Dell, but it has arguably done a better job putting out legitimately great products. The company’s history is dotted with unique laptops such as the G-Series, the Asus U33J Bamboo and, of course, the Zenbook. 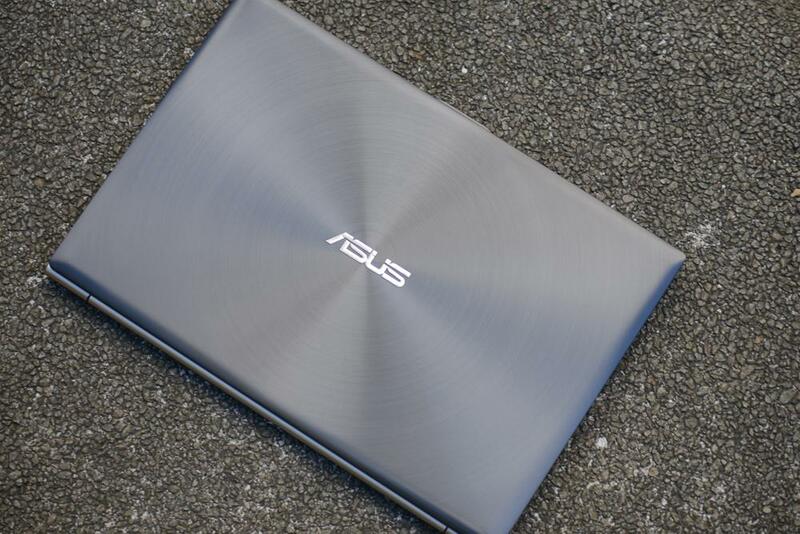 Asus recently gave its Zenbook an overhaul and introduced a new improved model, the Zenbook Prime. Display quality is the headliner. Asus ships the laptop with a 13.3-inch 1080p display. That alone would be noteworthy, but the company goes further by installing a high-quality IPS panel rather than the mundane TN panel found in most laptops. Don’t think that Asus has skimped elsewhere, however. Our review unit arrived with a Core i7-3517U processor, which is among the beefiest you’ll find in an Ultrabook. The UX32 model we’re reviewing also packs in an Nvidia GT 620M graphics processor and a 500GB mechanical drive paired with a solid-state cache drive. This is different from the UX31 models, which use Intel-integrated graphics but also offer one large, fast SSD. Of course, none of this stuff is free. Our variant sells for $1,299. That puts Asus up against tough competition including the MacBook Air, HP Envy Spectre 14 and Lenovo ThinkPad X1 Carbon. Let’s see if the display can make this laptop stand out. 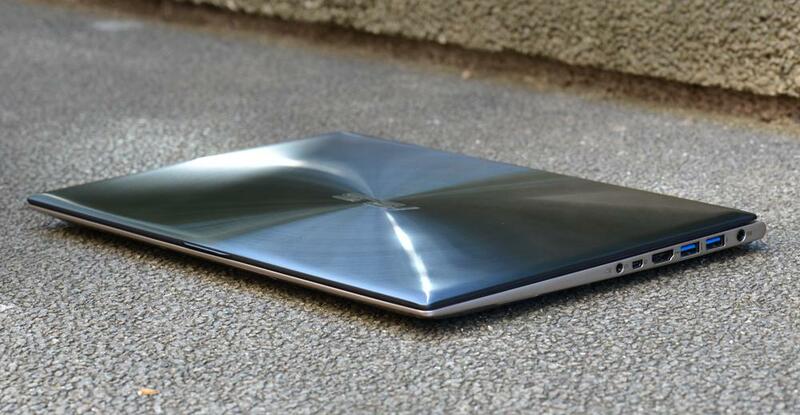 The original Zenbook was one of the thinnest Ultrabooks on the market at the time. This remains true of the UX31, but fitting discrete graphics into the UX32 has added additional bulk to the front of the laptop. It’s still about 18mm thin, but unlike the UX31 version, the chassis has no taper at the front. This makes the UX32 thicker overall. One advantage to the UX32’s additional bulk is better build quality. The thinner Zenbooks have issues with flex. Handle them the wrong way, and the entire chassis bends, causing the laptop to wobble even when on a level surface. We could not replicate this issue with our review unit. Adding thickness also improves connectivity. You receive three USB 3.0 ports, a full-size HDMI, a mini-DisplayPort, a combined headphone and microphone jack and a card reader. The UX32 is well equipped for a laptop of any size and exceptionally equipped for an Ultrabook. These significant differences aside, this model is similar to the UX31 and the original Zenbook. 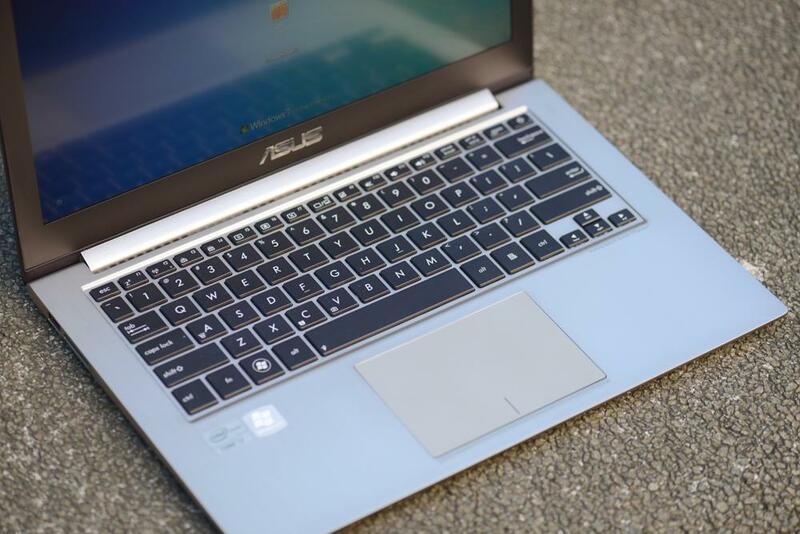 Asus has cleaned up the design by removing the cheesy cursive text that runs below the display and by changing the keys from silver to black. These adjustments haven’t made the UX32 a supermodel, however. The MacBook Air and HP Envy 14 Spectre are better options if style is a concern. The UX32’s keyboard performs well in all areas. It offers reasonable key travel and feel while also providing a spacious layout that doesn’t skimp on any particular key. Asus still doesn’t understand how to design premium key-caps, and the black plastic keys seem chintzy as a result. But this is a minor complaint. Backlighting is standard on all Zenbook Prime models. You control brightness via keyboard function keys, and you’ll find several different settings. This is a small extra that should be valued, although most laptops in this price range offer the same features. Touchpad quality proved superb. The surface is large, smooth and sensitive to multi-touch gestures. We wish that the integrated left and right mouse buttons offered more travel, but the touchpad does a good job of registering taps as mouse clicks. Using the physical buttons is rarely necessary. As mentioned, all Zenbook Prime models come with a 1080p display using IPS technology that promises excellent performance. In most respects, the UX32 delivers. Viewing angles are wide and black levels deep, resulting in excellent contrast and accurate colors. Asus manages this while using a matte coating that, combined with a bright backlight, makes the display tolerable even when you use it in full sunlight. Unfortunately, one serious flaw dims the display’s brilliance is backlight uniformity. Some of the LEDs that light the display edges shine brighter than others, creating hotspots along the display’s edges during dark scenes. We noticed one area that was easy to see during movies and games and two others that were occasionally noticeable in the same content. The problem is not confined to this laptop, either. We’ve witnessed the problem in all three UX31 and UX32 models we’ve used since Asus released laptops with this display. Does the problem ruin the laptop? No. This is still an excellent display that far outpaces competitors in most situations. But anyone considering the laptop must note these issues and understand that they undermine what should be the laptop’s standout feature. Audio quality was even in disposition. The audio is not amazing, but it’s capable of filling a small room with enjoyable sound. We thought the audio was great on movies and games because the computer provides enough bass to replicate deep tones – for a while. Constant hammering by bass-heavy music causes some distortion. The UX32 is not as thin as its brethren nor is it among the thinnest Ultrabooks, which could mean good things for cooling. But it doesn’t. During our testing, we typically read idle temperatures between 88 and 94 degrees Fahrenheit. Running a benchmark load easily increased temperatures to as high as 107 F. Much of the heat ends up along the keyboard, which creates an uncomfortable experience. The fan is relatively soothing at load and difficult to notice at idle. 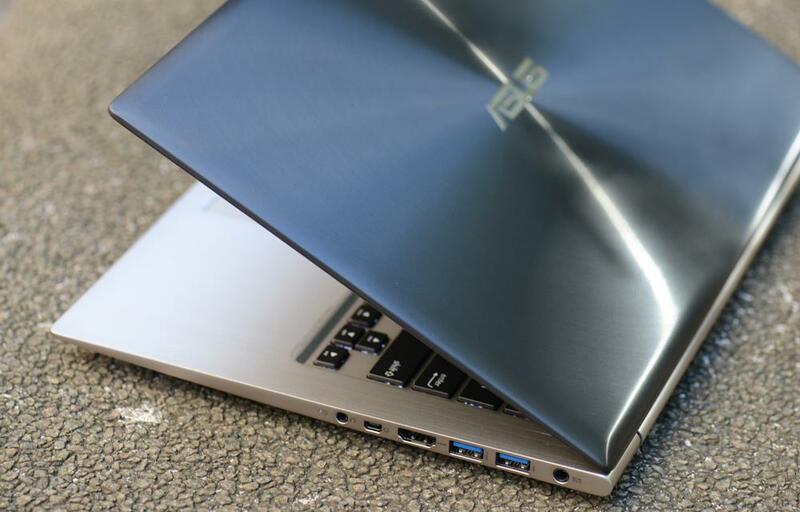 Most Ultrabook manufacturers make the same choice, however, preferring heat rather than noise. We’ve already mentioned the UX32’s size, but we repeat: This is not a thin laptop. At about 18mm throughout, it’s much thinner than the average mainstream laptop and thinner than most Ultraportables. Laptop bags and backpacks will accommodate it with room to spare. Asus ships the laptop with a small, square power adapter that you can easily slide into a spare backpack pocket. You’ll need it. Our Battery Eater test ran through this laptop in just an hour and 49 minutes, while the light-load reader’s test consumed the battery in five hours and 19 minutes. The Peacekeeper browser benchmark, which acts as a stand-in for heavy Web browsing, killed the battery in three hours and 21 minutes. All of these results are below par for an Ultrabook. We’re sure the bright, high-resolution display is the reason for such poor endurance. But whatever the cause, the result is the same. This laptop is ill suited for long trips. Our review unit came equipped with the standard Asus array of software. This includes features such as Asus WebStorage and Asus Fun Center, which provide extras that most people will never bother using. These services make their presence known through desktop shortcuts. More noticeable are the two widgets installed on the desktop by default. One controls power management, and the other controls the instant-on feature while also providing an estimate of remaining standby time. Both widgets can be handy and don’t obstruct normal laptop use. We also noticed that Asus shipped our review unit without an annoying antivirus trial. We appreciate this and think that omission was the right decision. Trial software belongs on no laptop, but it seems particularly distasteful when crammed on a “premium” product. The Core i7-3517U processor in our review unit is a standard part among high-end Ultrabooks, and it delivers standard performance. The UX32 reached a combined score of 41.12 GOPS in SiSoft Sandra’s Processor Arithmetic benchmark. It also achieved a combined score of 8,376 in 7-Zip. Both of these figures are in line with other high-end Ultrabooks. Less impressive is the laptop’s PCMark 7 score of 2,353. The mechanical hard drive caused this poor result. Although supplemented with a solid-state cache drive, the mechanical hard drive simply is incapable of competing with systems that use a solid-state drive as primary storage. The UX32 stands out from the competition by providing an Nvidia GT 620M mobile graphics processor. It proved its worth by driving 3DMark 06 to a result of 7,436 and 3DMark 11 to a score of 1,130. The Acer Aspire Timeline Ultra M5 is the only Ultrabook that scores better. Gamers should hold their excitement, however. The discrete GPU still is not enough to drive modern 3D games at the UX32’s native resolution. You’ll have to turn most titles down to 1600 x 900 or 1366 x 768 and play them at low or medium detail. Asus clearly has engineers who know what they’re doing. They are interested in high-resolution displays, attractive exteriors and excellent performance. 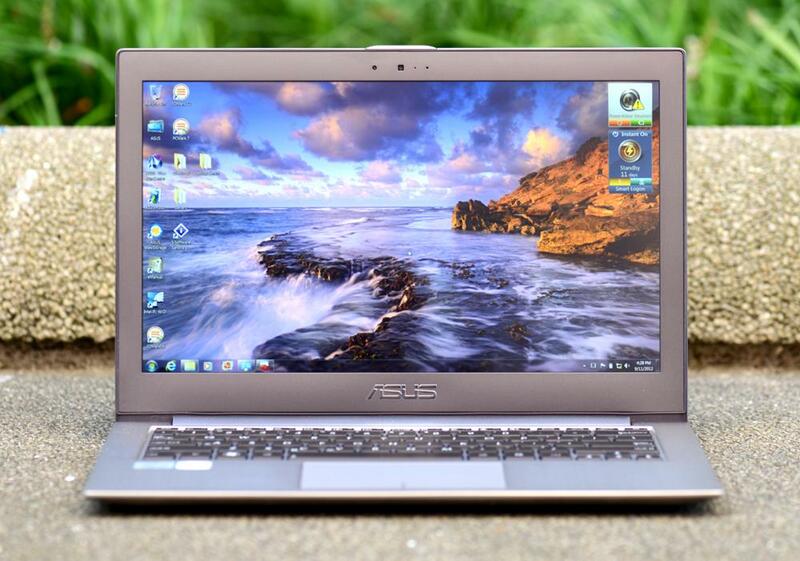 The UX32 is an engineering feat no other Ultrabook on the market can match. Unfortunately, the laptop fell short in our battery life testing. That’s a serious problem. It’s fair to assume someone buying a portable laptop expects it to offer great battery life. The UX32 is merely adequate. And then there’s quality control. The display is wonderful, but the backlight uniformity issues aren’t. We were incredibly disappointed to see a misbehaving backlight spoil the best laptop display we’ve used. And let’s remember the price tag of $1,299. This is a premium laptop, yet it has a backlight issue not found on much cheaper laptops. We respect the Zenbook Prime UX32 for what it tries to accomplish, but we have mixed feelings about it as a product. Give it a look, but also consider the MacBook Air and HP Envy 14 Spectre.